Gall Thomson Emergency Release and Shut-Off Couplings (ERSOC) minimise the risk of offshore spills at FPSO/FSOs caused by anticipated emergency scenarios when the FPSO crew has enough time to disconnect the ERSOC. The ERSOC was developed using proven Gall Thomson Flip-Flap MBC technology. The ERSOC activation allows smooth hose maintenance/hose change-out and also prevents damage to the hose should severe weather be forecasted. The ERSOC provides a safe parting point in the marine hose transfer system for FPSO, FSO, barge applications and seawater transfer systems in anticipated emergency scenarios or in a routine hose change out. Gall Thomson self-energised Marine Breakaway Couplings are designed to react to tanker breakout or extreme pressure surge. The Gall Thomson ERSOC provides an additional facility for applications where controlled release over the transfer system is also required. The ERSOC therefore does not replace the MBC and the MBC must still be installed as the safeguard against immediate events such as tanker breakout. The activation of the Emergency Release Collar (ERC), under controlled conditions when the pumps of the FPSO/FSO have been stopped, allows the hoses to be disconnected at an identified parting point therefore preventing damage to the hoses and spillage of product contained in the hoses. FPSO/FSO hose string handling crude oil. FPSO/FSO hose string handling – Condensate or Methanol. Other types of offshore hose transfer systems requiring controlled release of the hoses. Compatible with all hydrocarbons, liquid gases and seawater: whether the hose is sealed, floating or in attenary configuration. Disconnection is required in an anticipated emergency. Disconnection is required in a routine hose change out. The Emergency Release and Shut-Off Coupling (ERSOC) has been designed to operate in a marine environment. Sizes: 6” to 24” nominal bore. Offshore grade forgings are used for the main body components. ERC collar: Carbone steel parts nitrified using Tuffride coating. Extensive material testing combined with long-term field experience ensures performance integrity and in-service reliability in all environmental conditions. Designed for ANSI150lb or ANSI300lb. For other ANSI ratings, please contact Gall Thomson. 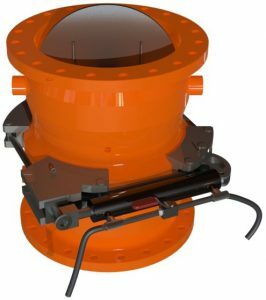 The Gall Thomson ERSOC uses the proven Flip-Flap MBC technology adapted for specific FPSO applications where a hose string is either permanently floating with a goose neck arrangement or for FPSO reel applications. The overlapping of the two Flip-Flap discs means that it is impossible for the disc to close while the ERSOC is assembled. The ERSOC design has been proven on activation mode on FPSO and platform applications since 2000. The ERSOC uses the Flip-Flap valve MBC technology proven since 1987. The Flip-Flap ERSOC offers minimal headloss. 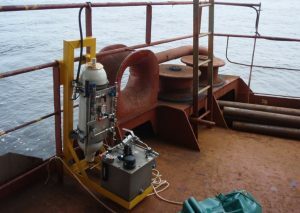 Valve-less applications are available for seawater applications. 100% leak-tight closure provides totally safe and spill-free disconnection; ideally suited for FPSO operations involving liquid gases, hazardous chemicals, white oil products, low viscosity and low velocity fuels. The Flip-Flap ERSOC Marine Breakaway Coupling design provides minimal headloss. The arrangement of the two overlapping Flip-Flap discs offers a unique arrangement for this type of application. There are no moving parts during the normal service of the ERSOC. This eliminates the requirement for maintenance whilst installed in the hose string. The units should be removed for refurbishment at 3-5 year intervals; normally during a hose string change-out. The device has its own pre-charged accumulator therefore requiring no ship power source. The ERSOC is compact, providing minimum footprint on the FPSO deck. The ERSOC can be provided as a standalone device or integrated to the ICSS FPSO system. The ERSOC can be installed in vertical or horizontal plains and at vessel manifold. 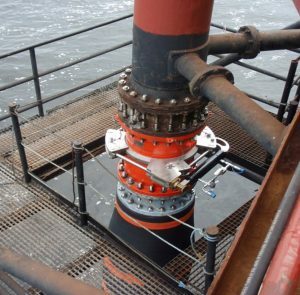 ERSOC can also be installed on FPSO reels. The Electroless Nickel Plating internally applied to the ERSOC protects against internal wear and corrosion. The alignment of the Flip-Flap discs in the product flows allow the body diameter of the ERSOC to be smaller than its flanges. The weight of the ERSOC is also minimised due to this design feature. The ERSOC has a smooth ‘snag-free’ exterior profile (released coupling half). The ERSOC does not generate significant loads on the FPSO and export vessel manifolds. The ERSOC and its additional equipment (power pack, accumulator) takes minimal space on the FPSO/FSO deck. This enables a practical ERSOC retrofitting operation. The power pack with pre-charged accumulator, which can be installed at any convenient location on the vessel deck, will release the hose string from the vessel manifold instantaneously at the flick of a switch. The shut-off on the Flip-Flap valve is powered by springs closing immediately after the ERSOC activation. The ERSOC can be re-instated after an activation or re-installed in a new hose string during a routine hose change out. The ERSOC has a proven life span of up to 20-25 years assuming the maintenance is carried out at the recommended intervals. The ERSOC in its current configuration has been in service on an FSO in West Africa since 2011. The two parts of the ERSOC are held together with a clamp that can be activated remotely with a power pack either with a hydraulic ram or with an auto release nut/stud. 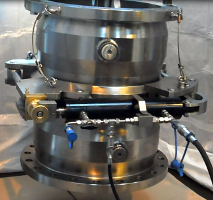 The system is manually operated via an accumulator and hand pump/hydraulic power pack arrangement connected to a Release Collar (RC). The coupling is activated by operation of a hand valve located on the accumulator. The 2m hose between the power pack and accumulator and the 15m hose between the accumulator and collar cylinder are fitted with quick couplings at each end. The collar is held together by the releasing tie bar which engages on the clamp locking plate and tensioned by the adjustable threaded ring. This is pre-loaded to provide the required clamping forces to overcome internal pressure in the flanges being clamped together. Release of the collar is achieved by the hydraulic cylinder forcing the releasing tie bar off the clamp locking plate. Upon opening valve, nitrogen pressure in the pre-charged (by manual hydraulic hand-pump) accumulator forces hydraulic oil into the Emergency Release Collar (ERC) cylinder causing the collar to be fired free of the tapered flanges. The two halves of the shut-off coupler are then free to part, allowing each valve disc to pivot and move forward instantaneously onto its “O” ring seal effecting closure. Upon open opening a valve, the release operation is achieved by introducing pressure into a cavity in the containment sleeve causing it to displace axially. The axial displacement allows the male thread to push the nut inserts out of the engagement causing the load to be released. The two halves of the shut-off coupler are then free to part, allowing each valve disc to pivot and move forward instantaneously onto its “O” ring seal effecting closure.